Board certified in dermatology, Dr. Nayomi E. Omura received her medical degree in 1996 from the State University of New York at Buffalo School of Medicine and Biomedical Sciences in Buffalo, New York. She completed her internal medicine internship at George Washington University Hospital in Washington, DC, followed by a three-year dermatology residency at Dartmouth-Hitchcock Medical Center / Dartmouth Medical School in New Hampshire. 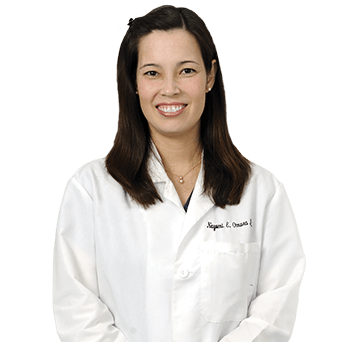 During her residency, Dr. Omura served as chief resident in dermatology, as well as instructor of medicine and associate professor of dermatology at Dartmouth Medical School. Dr. Omura then completed a one-year fellowship in cosmetic surgery and laser with SkinCare Physicians of Chestnut Hill, Massachusetts. Dr. Omura joined Water’s Edge Dermatology in 2002, practicing general medical, surgical, and cosmetic dermatology.